After the joyous light and shade of Britten’s Midsummer Night’s Dream on the Spring tour 2010, James Conway moved into a far darker area of the Shakespearean canon this autumn with a brand new opera and an ETO commission. 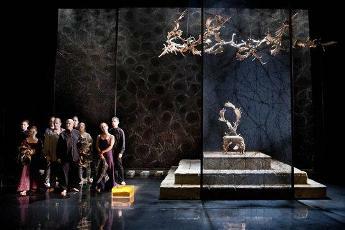 King Lear is an opera project that has defeated many composers, Verdi and Britten to the fore among them. Yet Alexander Goehr (working with the late Frank Kermode) took the direct route into this particular subject matter: unable to encompass in music the whole of Shakespeare’s sprawling, episodic, often infuriating (though always enthralling) tragedy, they lifted twenty-four short scenes from the play, re-arranged their order and presented a quintessential Lear: the human tragedy that is at its heart, the character-driven narrative that gives the play its unique power onstage. The result, in the last performance of this year’s ETO tour at Snape Maltings, was a powerful piece of music theatre, a work of undeniable quality albeit elusive in its emotional appeal. On first hearing, a work to be admired, if not yet to be loved unconditionally. The twenty-four scenes (called ‘preludes) that make up Promised End were five years in the writing and eighteen months in development, including an extended workshop earlier this year at Dartington Hall with the ETO principals. This scrupulous preparation showed: the work moves well, is fluent and is full of striking visual and dramatic moments. It starts with a wonderful Brechtian moment: with house lights up, the entire cast shuffle onstage in a group and eyeball the audience into gradual silence. The house lights dim, and the piece begins. The stage is divided into various areas, one for the entire cast as a sort of Greek chorus, commenting on events as they unfold, one for the principals, who invariably dip their feet into a large tray full of turmeric powder before proceeding to their allotted theatrical space. They thus leave visual trails behind them, the element of ritual being never far absent: we are reminded that a play is being performed, and that rules are being followed. In terms of Personenregie I found it engrossing and delightful in equal measure. But what about the music, and the work as opera? Goehr has had his passionate adherents and his detractors over many years, and it would be idle to claim that this is approachable music. Description is perhaps the best way to convey the musical style of Promised End. Onstage, behind a rear gauze, is a group of musicians from the Aurora Orchestra, mainly woodwind and brass with a small string ensemble, organ and guitar. Goehr himself describes his orchestra as a ‘kind of military band’ and their music is highly rhythmic, with rasping sonorities and an undoubted percussive ‘system’ driving it all. The storm scene was particularly exciting. Against this rather harsh sound world, Goehr gives his soloists a series of quite lyrical passages of arioso, never more so than when Cordelia (who doubles as the Fool) sings her refrains to an accompaniment of organ and guitar. 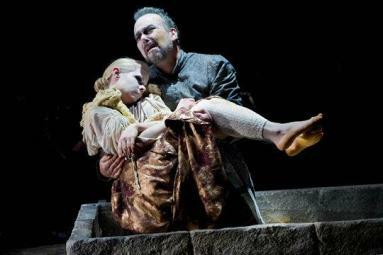 Lina Markeby was both effective and touching in this dual role, bringing moments of true operatic pathos to the stage. But she alone was given this kind of leitmotif in terms of sonority: all the other characters, including her two evil sisters, had to cope with the sound made by horns, tubas, trumpets, clarinets and tympani. And in the course of the evening, this proved to be a sonic miscalculation: at moments of orchestral excitement, it was virtually impossible for the principals to be heard clearly, no matter how hard they tried with their diction. So large swathes of Shakespeare’s text were mouthed, delivered, but definitely unheard. With a wind and brass dominated orchestra, a much better decision would have been to put them in the pit! Roderick Earle sang Lear, bringing to the role an impressive and noble stage presence and a warm, dark quality to his baritone line. Had his key words at the play’s climactic moments been more audible, the effect would have been more powerful still. Edgar and Edmund were contrasted nicely: as the former, Adrian Dwyer had a bright, easy tenor sound that spoke of his essential goodness, while as the latter, Nicholas Garrett produced an incisive, quite steely baritone that marked out his character as a man (unfortunately) to be reckoned with. Garrett also produced the best diction of the evening. The roles of Goneril and Regan, although strongly sung and well characterized by Jacqueline Varsey and by Julia Sporsen respectively, did not seem to me to convey the real sense of what these two characters are all about. Shakespeare’s text for them is so vivid, so lush that a musical setting of the words needs incredible power alongside deep cunning and subtlety. At first hearing, I did not really ‘get’ the musical portrayal deployed here. That leaves Gloucester, the character whose physical suffering is almost harder to take than Lear’s descent into madness, and who clearly interests Goehr as the other central figure of the tragedy (Goehr has described his piece as the story of two old men, written by two old men). Nigel Robson, hugely experienced in singing Goehr’s music over many years, brought very strong vocal qualities to the tenor line: a tone of burnished steel, incisive pitch, a real singing actor’s sense of performance. His interaction with Lear towards the end was moving and rather wonderful. Once again, I find it impossible to decipher the melodic outlines of his arioso passages against their punchy accompaniment, but Gloucester’s music always interested me and Robson proved to be a tower of strength throughout. “Howl, howl, howl” says Lear in Act Five Scene Three of Shakespeare’s play, and holding Cordelia’s dead body goes on to agonise: “She’s dead as earth. Lend me a looking glass, If that her breath will mist or stain the stone, Why then she lives”. And Kent murmurs: “Is this the promised end?” In Goehr’s final scene, absent Kent but with the corpse of a fool hanging from an onstage gallows, Cordelia sings a haunting prophecy and the piece fades into silence. It is a remarkable stage moment, an operatic passage of real quality. On reflection, I have some private doubts about the truly operatic nature of Promised End. The sonorities of the orchestral accompaniment and the driven nature of many of the rhythms (the whole piece being brilliantly conducted by Ryan Wigglesworth, proving once again his mastery of ‘difficult’ modern music) are very difficult to reconcile with the solo lines of the principals. They seem at times to inhabit two different sound worlds, converging almost by accident but then setting off again on their own separate ways. And the question that must be asked is what the music really adds to this incredibly rich, bleak, horrifying, inspiring Shakespeare text: how are the words enhanced, nuanced, put into new context? It is a cop-out to say that a single hearing of a work as new and complex as this cannot do it justice, so I shall avoid that. What I shall say instead is that Goehr and ETO gave their audience an enthralling experience, beautifully staged, acted and sung with the utmost integrity and with some wonderful moments along the way. That seems to me pretty good going for starters.